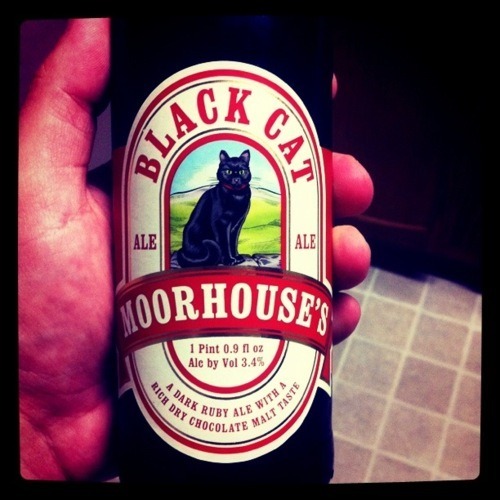 Black Cat’s mocha latte nose gives way to chocolate, coffee, and licorice tones, tempers by a dry fruit note and a slight creaminess that-when served at a slightly more chilled temperature than most ales-can be both satisfying and refreshing. Oh man, this beer smells horrible. I was all excited about this beer… picked it out of a good lineup of porters and stouts. Then I poured it, and stuck my nose in the glass. And… yuck! It smells horrible. It almost has a metallic nose to it. Anyway, let’s see if the taste is any better. Nope… it’s not. Man, that stinks. I had such high hopes for this brew. I love the logo too. I don’t like cats, but it made me curious. The story is pretty cool, with the guy who bought (and saved) the brewery from going under still owns it today. But that’s not enough for me to want to drink the beer. Plus, it has a VERY low ABV, and while that might not always be a bad thing, it is here. Yeah, this beer is pretty bad. I bet it gets better as it warms up, but I am not willing to let it sit around to find out. Something odd that Ricky told me about this beer as we were pouring it into glasses is that it has an ABV of only around 3%. What the heck? Not sure I have ever heard of a beer with an ABV that low. Seems kind of strange. But let’s give it a chance. It has an interesting smell, smelling strongly of what seems to me like pure cocoa. Not hot chocolate mix, but like a dark chocolate cocoa bean smell. At first it almost smelled of bitter coffee. It looks about like dark chocolate or coffee, what with the dark color and not much head at all. Let’s try it. It took me two sips to really get much idea about the taste. It doesn’t have a lot of initial taste. In a way, it reminds me of coffee, as weird as it sounds. Black unsweetened coffee has a very distinct taste while at the same time not really having a taste at all (at least this is how I describe it). This beer has kind of a similar thing going on. The aftertaste is actually a bit better than the first taste of the beer itself. That is where there is a bit of cocoa taste, but it doesn’t really taste too great. While this beer is somewhat distinctive, it’s not my favorite taste by any means. It’s not horrible, but not great, in my opinion. It definitely wouldn’t be among my first choices to purchase again.